Flooring refers to permanent covering of floors that manages landscape attributes for visual appeal, pedestrian movement, and provide support to other infrastructural elements. Terrazzo comprises recycled aggregates such as recycled glass pieces, marble chips, and others coupled with the binding matrix such as epoxy resin or cement. 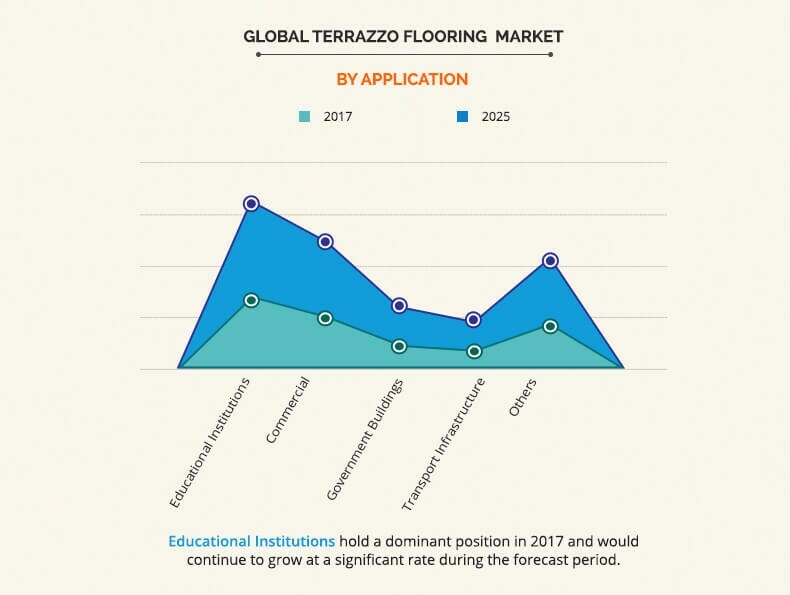 The global terrazzo flooring market was valued at $21,691.1 million in 2017, and is projected to reach $31,951.2 million in 2025, growing at a CAGR of 4.9%. Increase in construction, renovation, and retrofitting activities is the key factor that drives the growth of the global terrazzo flooring market. In addition, increased emphasis on use of green and eco-friendly floorings, such as terrazzo, is expected to propel the global market growth. Moreover, key market players have adopted various strategies, such as business expansion and acquisition, to strengthen their market presence, which boost the growth of the market. For instance, in 2017, RPM International acquired Key Resin Co., a manufacturer of polymer flooring and coating systems, which positively contributed toward the growth of the terrazzo flooring industry. However, high initial cost & installation cost of terrazzo flooring is expected to hinder the growth of the market. The global terrazzo flooring market is segmented based on type, application, and region. On the basis of type, the market is fragmented into epoxy terrazzo and cement-based terrazzo. The epoxy terrazzo segment is anticipated to dominate the global market throughout the study period. The applications covered in the market include educational institutions, commercial buildings, government buildings, transport infrastructure, and others. The educational institutions segment is projected to dominate the global market in the near future. By type, the market is bifurcated into epoxy terrazzo and cement-based terrazzo. 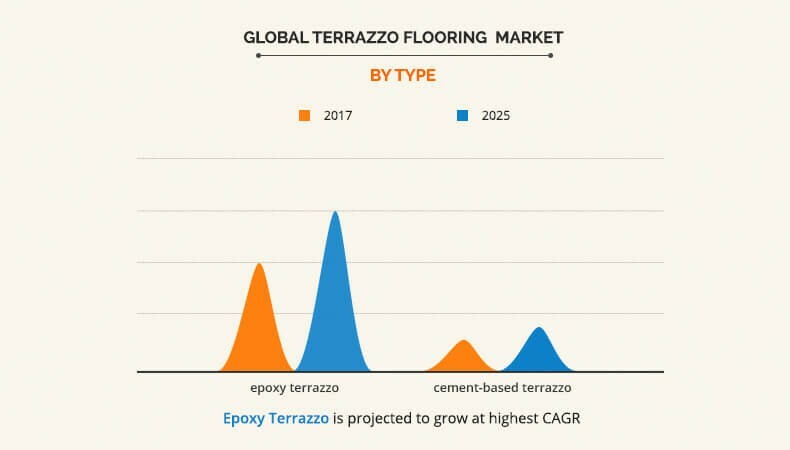 Among these, the epoxy terrazzo segment is expected to grow at a significant growth rate during the forecast period, owing to its low maintenance and abrasion-resistant nature. In addition, its prolonged shelf life and eco-friendly nature make it a preferred choice for sustainable designs of flooring. The market is analyzed across North America, Europe, Asia-Pacific, and LAMEA. Among these, North America held a significant share in the global market in 2017, however, Asia-Pacific is projected to register the highest CAGR during the forecast period. 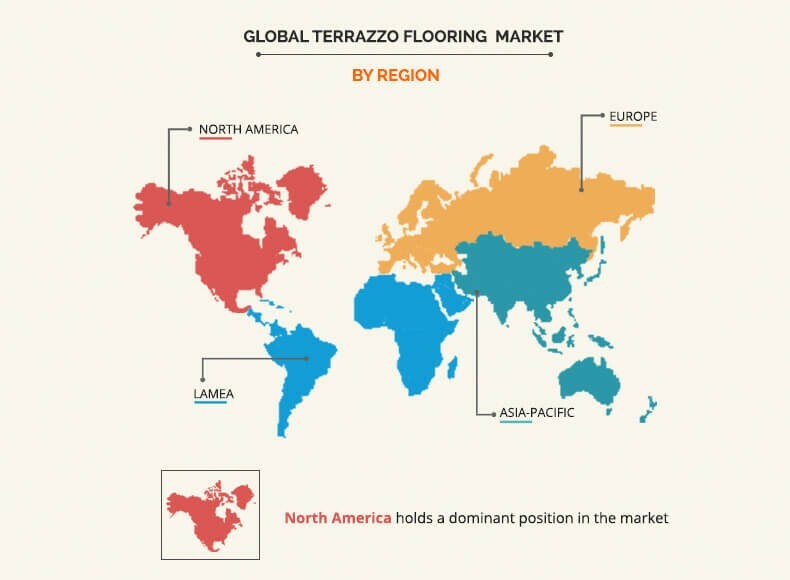 The study provides an in-depth analysis of the global terrazzo flooring market along with the current trends and estimations to elucidate the imminent investment pockets. The Venice Art Terrazzo Co., Inc.
7.5. CONCORD TERRAZZO COMPANY, INC.
7.6. THE VENICE ART TERRAZZO CO., INC.
Terrazzo is a composite material made up by combining aggregates such as recycled glass pieces, marble pieces, or other such aggregates with epoxy resin or cement binder. Flooring made through terrazzo offers high-end aesthetics and endurance. Outdoor entertainment areas, such as patio, porches, and backyards, have gained popularity in the past few years, owing to their semi-natural ambience and functional utility for small gatherings. As a result, millennials are increasingly opting for outdoor entertainment areas in their residences. This in turn has driven the demand for terrazzo floorings in residential buildings, such as row houses, bungalows, townhouses, and condos. 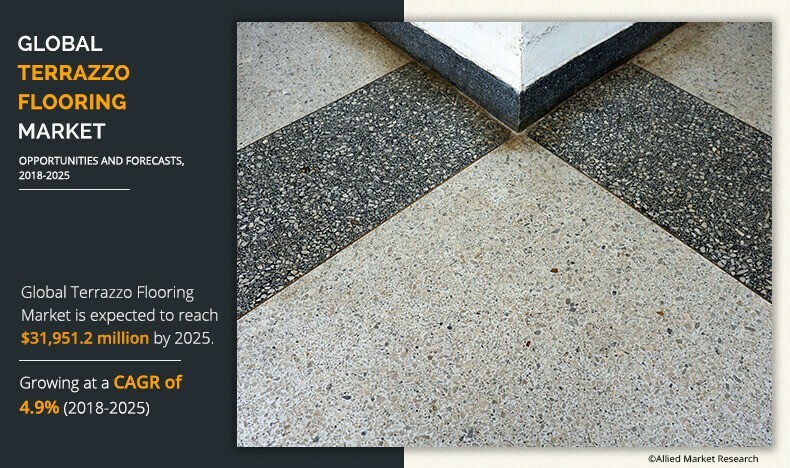 In addition, upsurge in demand for sustainable and green flooring fuels the market for terrazzo floorings. The demand for terrazzo flooring is on a rise across the U.S., Europe, and Asia. In the U.S., trending terrazzo floorings such as Palladiana terrazzo and large aggregate precast terrazzo panels cut from solid blocks are witnessing burgeoning demand, thereby driving the market growth. In addition, major players have adopted key developmental strategies, such as product launch, to fuel the growth of the market. Moreover, they have introduced advanced designs to boost the demand for terrazzo floorings. For instance, in April 2018, Flowcrete launched Mondéco Rapide, a new resin terrazzo flooring system, which offers a robust and decorative finish in lesser amount of time. This new resin terrazzo system is based on PUMMA technology, which offers enhanced aesthetics and appeal in a rapid turnaround. Based on type, the global terrazzo flooring industry is categorized into epoxy terrazzo and cement-based terrazzo. The epoxy terrazzo flooring segment is projected to dominate throughout the analysis period, owing to its low cost, prolonged durability, flexible design, and easy installation. Furthermore, large scope of application of terrazzo flooring in commercial spaces, such as offices, buildings, malls, large public spaces, and others, has positively impacted the market.